On Wednesday I shared a similar card with traditional colours. I did a couple of things differently this time to give this card a more contemporary look. 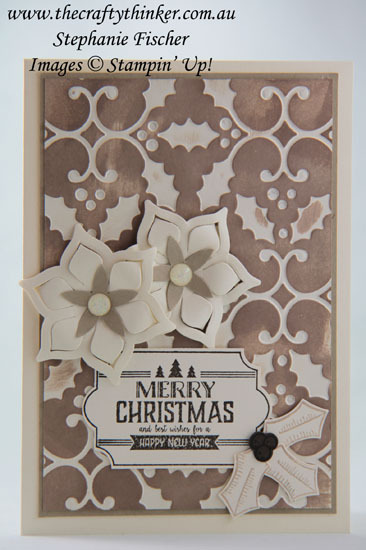 The base card is Thick Very Vanilla and I embossed a piece of Very Vanilla cardstock with the Holly embossing folder. This time, I used the reverse side of the embossed piece (so that the holly pattern is debossed) and swiped a Crumb Cake ink pad over the piece. I used the Eastern Medallions and Blossom Builder Punch again to make the "poinsettias" but this time using Very Vanilla and Crumb Cake cardstock. The centres are very pale Daffodil Glitter Enamel Dots. I used Early Espresso ink (stamped off) for the label and crumb cake ink for the holly leaves. The holly berries are Early Espresso ink on Early Espresso cardstock. Thank you so much, Carol! I really appreciate your comment!